Matthew Bolitho, Michael Kazhdan, Randal Burns, Hugues Hoppe. Symposium on Geometry Processing 2007 . Out-of-core solution of huge Poisson system to reconstruct 3D scans. Abstract: Reconstruction of surfaces from huge collections of scanned points often requires out-of-core techniques, and most such techniques involve local computations that are not resilient to data errors. We show that a Poisson-based reconstruction scheme, which considers all points in a global analysis, can be performed efficiently in limited memory using a streaming framework. Specifically, we introduce a multilevel streaming representation, which enables efficient traversal of a sparse octree by concurrently advancing through multiple streams, one per octree level. Remarkably, for our reconstruction application, a sufficiently accurate solution to the global linear system is obtained using a single iteration of cascadic multigrid, which can be evaluated within a single multi-stream pass. We demonstrate scalable performance on several large datasets. Hindsights: The streaming algorithm in this paper implements a prolongation-only (i.e. cascadic) multigrid solver over an adaptive 3D octree. In our ISVC 2009 paper, we apply domain decomposition to parallelize this cascadic multigrid computation. 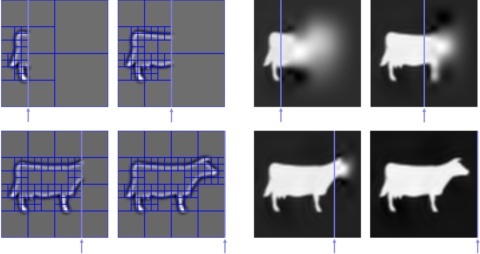 Our SIGGRAPH 2008 paper achieves a full V-cycle multigrid as a streaming algorithm, although over a regular grid rather than an adaptive quadtree.